Considering the three McKinsey PEI dimensions Leadership, Personal Impact and Entrepreneurial Drive – is it a good idea to include aspects from other dimensions in your PEI example? Some McKinsey candidates seem to be overly motivated and want to include aspects from all 3 PEI dimensions (Leadership, Personal Impact and Entrepreneurial Drive) in just 1 single example. Continue reading Considering the three McKinsey PEI dimensions Leadership, Personal Impact and Entrepreneurial Drive – is it a good idea to include aspects from other dimensions in your PEI example? How detailed does the McKinsey Personal Experience Interview really get? And it is true that interviewers sometimes ask about the precise words you were using in a specific situation of your PEI example? After having the first PEI coaching session with me, basically all candidates are really surprised by how detailed the McKinsey PEI gets. Most candidates finish preparing their examples by themselves on a level where it just starts to get interesting for the interviewer. Continue reading How detailed does the McKinsey Personal Experience Interview really get? How complex does a McKinsey PEI example need to be? Your examples as such do not need to – and even should not – be complex at all! Actually it makes much more sense using examples with low complexity of the general situation/context. Because in 10-15 minutes Personal Experience Interview time, it would just take an inappropriate huge amount of time just to have the interviewer understand what the example is all about. And you will end up having way too little time for showing your particular skills in your actions, and even more importantly in your decision-making rationale (according to the PARADE framework). Continue reading How complex does a McKinsey PEI example need to be? The key issue for the interviewer is to understand whether your success in one situation can be repeated in another situation. Therefore it is critical for the interviewer to understand the concrete thought process (a.k.a. „decision-making rationale“ in the PARADE framework). As opposed to other, more general interview formats of other consulting companies or any other industry, the McKinsey PEI is focused on very specific situations. Following the PARADE framework mentioned earlier, it is perfectly ok to start with an overview about the problem, anticipated consequence and your role, but from then on your example needs to become very focused and detailed. Amazingly, most candidates are very well-prepared for the McKinsey case interview itself, but have a severe lack of understanding about the McKinsey Personal Experience Interview (or short McKinsey PEI). Unfortunately, most of them don’t even get the basics right. They fail miserably in their once-in-a-lifetime opportunity to get one of the rare job offers from McKinsey, just because of underestimating the importance and difficulty of the PEI and lack of preparation. So what are the three most common fatal mistakes candidates are making in their McKinsey PEI? Not differentiating correctly between different McKinsey PEI dimensions, especially between “Leadership” and “Personal Impact” dimension. What are some typical McKinsey PEI questions during your interviews? This is one of the most common question from candidates in my PEI coaching sessions. Everyone seems to be curious how a real McKinsey PEI (Personal Experience Interview) is starting, and how difficult it is to find out which of the dimensions the interviewer is referring to (Leadership, Personal Impact or Entrepreneurial Drive). Continue reading What are some typical McKinsey PEI questions during your interviews? 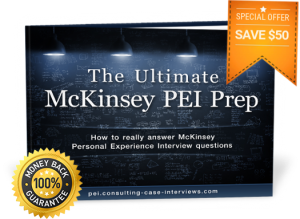 Before downloading The Ultimate McKinsey PEI Prep eBook, lots of candidates email me and ask how to best prepare for the McKinsey PEI. Whenever receiving such emails, I need to smile. Not because it’s a funny question, but because it shows to me that a candidate is generally on the right track in the McKinsey interview prep. But why can I say that a candidate is on the right track, just because he is asking me how to prepare for the McKinsey PEI?